2. Observe that a flat platform, or stage as it is called, extends between the upper lens system and the lower set of devices for providing light. The stage has a hole in the center that permits light from below to pass upward into the lenses above. The object to be viewed is positioned on the stage over this opening so that it is brightly illuminated from below (do not attempt to place your slide on the stage yet). Note the adjustment knobs at the side of the stage, which are used to move the slide in vertical and horizontal directions on the stage. This type of stage is referred to as a mechanical stage. 3. A built-in illuminator at the base is the source of light. Light is directed upward through the Abbe condenser. The condenser contains lenses that collect and concentrate the light, directing it upward through any object on the stage. It also has a shutter, or iris diaphragm, which can be used to adjust the amount of light admitted. A lever (sometimes a rotating knob) is provided on the condenser for operating the diaphragm. Figure 1.1 The compound microscope and its parts. Courtesy of OlympusAmerica, Inc. Figure 1.2 Proper handling of a microscope. Both hands are used when carrying this delicate instrument. The condenser can be lowered or raised by an adjustment knob. Lowering the condenser decreases the amount of light that reaches the object. This is usually a disadvantage in microbiological work. It is best to keep the condenser fully raised and to adjust light intensity with the iris diaphragm. 4. Above the stage, attached to the arm, a tube holds the magnifying lenses through which the object is viewed. The lower end of the tube is fitted with a rotating nosepiece holding three or four objective lenses. As the nosepiece is rotated, any one of the objectives can be brought into position above the stage opening. The upper end of the tube holds the ocular lens, or eyepiece (a monocular scope has one; a binocular scope permits viewing with both eyes through two oculars). 5. Depending on the brand of microscope used, either the rotating nosepiece or the stage can be raised or lowered by coarse and fine adjustment knobs. These are located either above or below the stage. On some microscopes they are mounted as two separate knobs; on others they may be placed in tandem (see fig. 1.1) with the smaller fine adjustment extending from the larger coarse wheel. Locate the coarse adjustment on your microscope and rotate it gently, noting the upward or downward movement of the nosepiece or stage. The coarse adjustment is used to bring the objective down into position over any object on the stage, while looking at it from the side to avoid striking the object and thus damaging the expensive objective lens (fig. 1.3). The fine adjustment knob moves the tube to such a slight degree that movement cannot be observed from the side. It is used when one is viewing the object through the lenses to make the small adjustments necessary for a sharp, clear image. 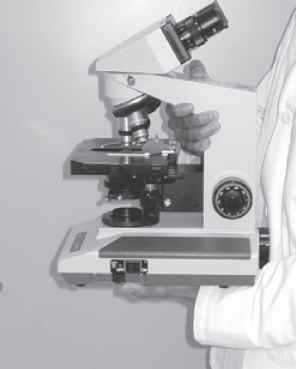 Figure 1.3 When adjusting the microscope, the technologist observes the objective carefully to prevent breaking the slide and damaging the objective lens of the microscope. Turn the adjustment knobs slowly and gently, as you pay attention to the relative positions of the objective and object. Avoid bringing the objective down with the fine adjustment while viewing, because even this slight motion may force the lens against the object. Bring the lens safely down first with the coarse knob; then, while looking through the ocular, turn the fine knob to raise the lens until you have a clear view of the subject. Rotating the fine adjustment too far in either direction may cause it to jam. If this should happen, never attempt to force it; call the instructor. To avoid jamming, gently locate the two extremes to which the fine knob can be turned, then bring it back to the middle of its span and keep it within one turn of this central position. With practice, you will learn how to use the coarse and fine adjustment knobs in tandem to avoid damaging your slide preparations. 6. The total magnification achieved with the microscope depends on the combination of the ocular and objective lens used. Look at the ocular lens on your microscope. You will see that it is marked "10 X" meaning that it magnifies 10 times. Now look at the three objective lenses on the nosepiece. The short one is the low-power objective. Its metal shaft bears a "10X" mark, indicating that it gives tenfold magnification. When an object is viewed with the 10X objective combined with the 10X ocular, it is magnified 10 times 10, or X100. Among your three objectives, this short one has the largest lens but the least magnifying power. Workbook in Microbiology, 7/e the oil is to prevent any scattering of light rays passing through the object and to direct them straight upward through the lens. Notice that the higher the magnification used, the more intense the light must be, but the amount of illumination needed is also determined by the density of the object. For example, more light is needed to view stained than unstained preparations. 7. The focal length of an objective is directly proportional to the diameter of its lens. You can see this by comparing your three objectives when positioned as close to the stage as the coarse adjustment permits. First place the low-power objective in vertical position and bring it down with the coarse knob as far as it will go (gently!). The distance between the end of the objective, with its large lens, and the top of the stage is the focal length. Without moving the coarse adjustment, swing the high-power objective carefully into the vertical position, and note the much shorter focal length. Now, with extreme caution, bring the oil-immersion objective into place, making sure your microscope will permit this. If you think the lens will strike the stage or touch the condenser lens, don't try it until you have raised the nosepiece or lowered the stage (depending on your type of microscope) with the coarse adjustment. The focal length of the oil-immersion objective is between 1 and 2 mm, depending on the diameter of the lens it possesses (some are finer than others). Never swing the oil-immersion objective into use position without checking to see that it will not make contact with the stage, the condenser, or the object being viewed. The oil lens alone is one of the most expensive and delicate parts of the microscope and must always be protected from scratching or other damage. 8. Take a piece of clean, soft lens paper and brush it lightly over the ocular and objective lenses and the top of the condenser. With subdued light coming through, look into the microscope. If you see specks of dust, rotate the ocular in its socket to see whether the dirt moves. If it does, it is on the ocular and should be wiped off more carefully. If you cannot solve the problem, call the instructor. Never wipe the lenses with anything but clean, dry lens paper. Natural oil from eyelashes, mascara, or other eye makeup can soil the oculars badly and seriously interfere with microscopy. Eyeglasses may scratch or be scratched by the oculars. If they are available, protective eyecups placed on the oculars prevent these problems. If not, you must learn how to avoid soiling or damaging the ocular lens. 9. If oculars or objectives must be removed from the microscope for any reason, only the instructor or other delegated person should remove them. Inexperienced hands can do irreparable damage to a precision instrument. 10. 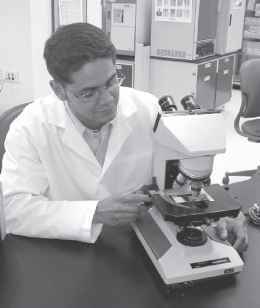 Because students in other laboratory sections may also use your assigned microscope, you should examine the microscope carefully at the beginning of each laboratory session. Report any new defects or damage to the instructor immediately. 1. Now that you are familiar with the parts and mechanisms of the microscope, you are ready to learn how to focus and use it to study microorganisms. The stained smear provided for you is a preparation of a yeast (Candida albicans) that is large enough to be seen easily even with the low-power objective. With the higher objectives, you will see that it has some interesting structures of different sizes and shapes that can be readily located as you study the effect of increasing magnification. You are not expected to learn the morphology of the organism at this point. 2. Place the stained slide securely on the stage, making certain it cannot slip or move. Position it so that light coming up through the condenser passes through the center of the stained area. 3. Bring the low-power objective into vertical position and lower it as far as it will go with the coarse adjustment, observing from the side. 4. Look through the ocular. If you have a monocular scope, keep both eyes open (you will soon learn to ignore anything seen by the eye not looking into the scope). If you have a binocular scope, adjust the two oculars horizontally to the width between your eyes until you have a single, circular field of vision. Now bring the objective slowly upward with the coarse adjustment until you can see small, blue objects in the field. Make certain the condenser is fully raised, and adjust the light to comfortable brightness with the iris diaphragm. 5. Use the fine adjustment knob to get the image as sharp as possible. Now move the slide slowly around, up and down, back and forth. The low-power lens should give you an overview of the preparation and enable you to select an interesting area for closer observation at the next higher magnification. Workbook in Microbiology, 7/e look at the body tube and bring the lens down close to, but not touching, the slide. Then, looking through the ocular, adjust the lens slowly, first with the coarse adjustment, then with the fine, until you have a sharp focus. Notice the difference in magnification of the structures you see with this objective as compared with the previous one. 7. Without moving the slide and changing the field you have now seen at two magnifications, wait for the instructor to demonstrate the use of the oil-immersion objective. 8. Move the high-dry lens a little to one side and place a drop of oil on the slide, directly over the stage opening. With your eyes on the oil-immersion objective, bring it carefully into position making certain it does not touch the stage or slide. While still looking at the objective, gently lower the nosepiece (or raise the stage) until the tip of the lens is immersed in the oil but is not in contact with the slide. Look through the ocular and very slowly focus upward with the fine adjustment. Most microscopes are now parfocal; that is, the object remains in focus as you switch from one objective to another. In this case, the fine adjustment alone will bring the object into sharp focus. If you have trouble in finding the field or getting a clear image, ask the instructor for help. When you have a sharp focus, observe the difference in magnification obtainable with this objective as compared with the other two. It is about 2| times greater than that provided by the high-power objective, and about 10 times more than that of the low-power lens. 9. 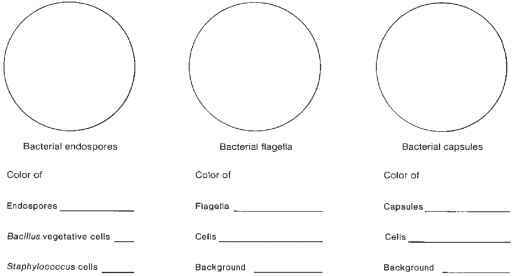 Record your observations by drawing in each of the following circles several of the microbial structures you have seen, indicating their comparative size when viewed with each objective. 10. When you have finished your observations, remove the slide from the stage (taking care not to get oil on the high-dry lens) and gently clean the oil from the oil-immersion objective with a piece of dry lens paper. Under each drawing, indicate the total magnification (TM) obtained by each objective combined with the ocular. 1. Always use both hands to carry the microscope, one holding the arm, one under the base (see fig. 1.2). 2. 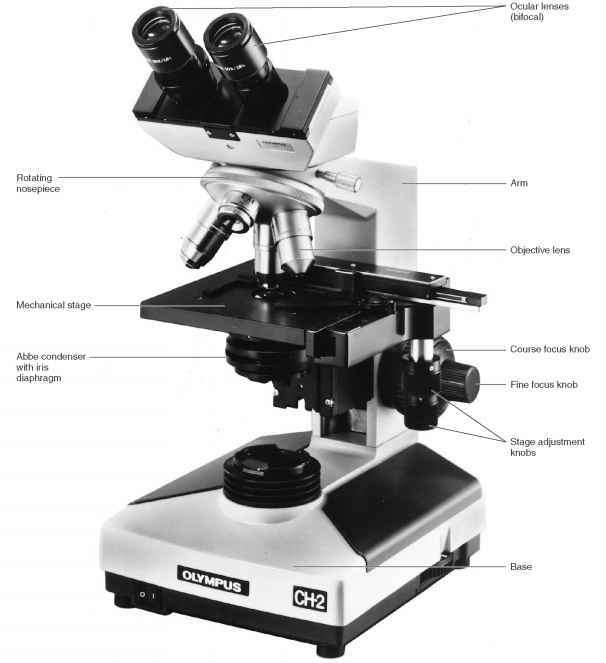 Before each use, examine the microscope carefully and report any unusual condition or damage. 3. Keep the oculars, objectives, and condenser lens clean. Use dry lens paper only. 4. At the end of each laboratory period in which the microscope is used, remove the slide from the stage, wipe away the oil on the oil-immersion objective, and place the low-power objective in vertical position. 5. Replace the dust cover, if available, and return the microscope to its box. Table 1 suggests possible corrections to common problems encountered when using a microscope. Check objective: is it locked in place? 1. List the optical parts of the microscope. How does it achieve magnification? Resolution? 2. What is the function of the condenser? 3. What is the function of the iris diaphragm? To what part of the human eye would you compare it? 4. Why do you use oil on a slide to be examined with the oil-immersion objective? 5. What is the advantage of parfocal lenses? 6. If 5X instead of 10X oculars were used with the same objectives now on your microscope, what magnifications would be achieved? 7. From reading in your textbook, can you name two other types of microscopes? Is their magnification range higher or lower than that of the compound light microscope? What to you grasp when lifting and carrying the microscope? What is the diaphragm on a microscope? Where is the diaphragm on a microscope and its functions? How does a compound light microscope work? How to use objective for oil immersion? What is the lamp on a compound light microscope? Why oil is immersed on the slide when using a x100 objective of the microscope?